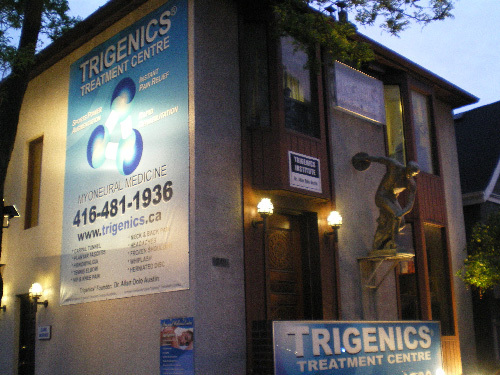 The Trigenics® Frozen Shoulder Clinic in Toronto is located just east of the Mt. Pleasant and Eglinton intersection, just north of the Davisville area of the city. The clinic is easily accessible via public transit or taxi/car. There is a bus stop right in front and the clinic has free parking. The clinic is less than 25km from Toronto’s Pearson International Airport (YYZ). The airport has ATMs and currency exchange kiosks as well as restaurants and other stores. The Toronto Transit Commission (TTC) offers a myriad of routes to and from the airport for a flat fee of $3.25 a person. This extremely reasonable cost is offset by the need for multiple transfers and long travel time (about 1-2 hours). From Pearson Airport terminal 3, take the #52 bus to the Lawrence subway station. Take line 1 subway southbound to Eglinton station. From Eglinton station, take the #34, #54, #56, or #100 bus and get off at the “Eglinton Ave East at Forman Ave.” bus stop. For patients who want the greatest travel comfort and flexibility, Pearson Airport offers pick-up and drop-off vehicle services at any of the six on-site rental agencies. Car rental counters are on level 1 of the parking garages adjacent to both terminal 1 and 3. At a cost of about $50-$60 and a travel time of about 30-60 minutes (depending on traffic), Pearson airport’s many taxi and airport limousine companies offer comfort, reliability, and peace of mind for our many patients. U.S. citizens do not need an Electronic Travel Authorization (eTA) or a visa to enter Canada but must present proof of citizenship in the form of a passport, birth certificate, etc. Other nationalities will require an eTA as of March 15, 2016. Click here to determine your exact entry requirements. Please contact us for personalized directions or other inquiries. We’re happy to arrange transportation to and from the airport or your accommodations in Toronto.